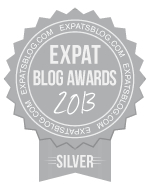 ExpatsBlog.com Expat Blog Awards 2013: South Africa Silver Award! This blog won the Silver Award for best expat blog in South Africa! 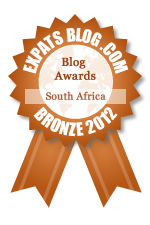 ExpatsBlog.com Expat Blog Awards 2012: South Africa Bronze Award! This blog won the Bronze Award for best expat blog in South Africa! I love reading this blog! She's been through so much with so little support and I really admire her resilience.